Born in Rio de Janeiro, Brazil on October 24, 1952, he started studying percussion in 1977 with Luiz Anunciação of the Orquestra Sinfônica Brasileira in Rio de Janeiro. Mr. Rosauro studied Composition and Conducting at the Universidade de Brasilia (Brazil). He then received his Masters Degree in Percussion at the Hochschule für Musik Würzburg in Germany under Prof. Siegfried Fink. He completed his Doctorate Degree at the University of Miami under the supervision of Fred Wickstrom. 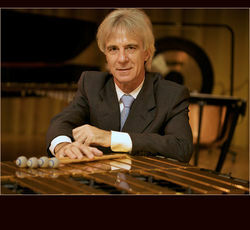 From 1975 to 1987 he was percussion instructor at the Escola de Musica de Brasília, and timpanist with the Orquestra do Teatro Nacional de Brasília in Brazil. As a composer he has published more than 100 pieces for percussion as well as several method books. His compositions are very popular worldwide and have been recorded by internationally acclaimed artists such as Evelyn Glennie and the London Symphony Orchestra. His Concerto for Marimba and Orchestra has been performed by over 2,500 different orchestras worldwide, and his ten solo CDs have received critical acclaim and been hailed by percussionists and general music-lovers alike. Dr. Rosauro is a Yamaha, Sabian and MalletWorks artist and plays exclusively with mallets and sticks by Vic Firth. This page was last modified on 16 July 2018, at 03:38.